The I-Timer is a direct replacement for the stock Model T mechanical timer. It provides reliable and consistent coil activation, precisely synchronized with piston position and never needs maintenance. Start on battery and run on Magneto or battery as usual. The I-Timer is immune to timing cover misalignment and provides precise ignition coil activation without wiper bounce, contact skip, contact wear, arcing or other mechanical flaws. Imagine never having to clean, lubricate or replace your timer ever again! Simply replace your mechanical timer with the I-Timer and enjoy smooth, optimal engine performance at any engine speed with properly adjusted stock Model T coils. 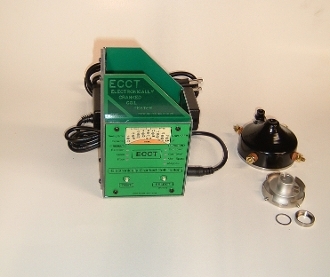 The Electronically Cranked Coil Tester (ECCT) is the new standard for testing and adjusting 1913-1927 Ford and K-W coils. Engine performance depends on ignition timing not coil current so ECCT coil adjustment is done by accurately measuring the time it takes the coil to fire the first spark. This allows you to set all 4 coils for equal firing time which minimizes coil to coil (cylinder to cylinder) timing variation to achieve optimal engine performance. The ECCT also tests the internal capacitor (Condenser) for proper value and leakage to ensure maximum point life and optimum coil performance. The ECCT comes with AC power supply (100-240VAC, 50/60Hz), PC interface cable and Magneto test cable. Weighing less than a pound, the ECCT is portable and easy to take on tour. The best engine performance possible with stock Model T coils.